RUSH: “CNN Poll: Democrats’ 2018 Advantage Is Nearly Gone” in the generic ballot. Back in December, the Democrats had a 15-point lead in the generic ballot. This is where pollsters ask, “In the next election, are you voting Republican or Democrat?” They don’t put names of candidates in, and they don’t ask about specific races. They just ask how people are gonna vote by party. The Democrats had a 15-, 16-point lead in December. It’s now gone. In addition to that advantage having vanished, the poll also shows that 60% of the American people think the country’s on the right track. “[S]ix in 10 saying that things in the country are going well amid improving approval ratings for the President’s handling of major issues, including the economy, immigration and foreign trade. Trump’s overall approval rating, however, held steady at 41%, but when you ask about specific issues, he’s way, way up. In fact, in fact… Oh, I hope did I print this out? The public polling data on the Mueller investigation — maybe it was from yesterday — it’s bad. More and more people now think the Mueller investigation is rotten to the core, not good, not working, they don’t think it’s good. (sigh) Oh, what did I do with that? Don’t doubt me. I don’t have the numbers in front of me, but — for some reason I think it was yesterday, and maybe it’s today when I printed it out. 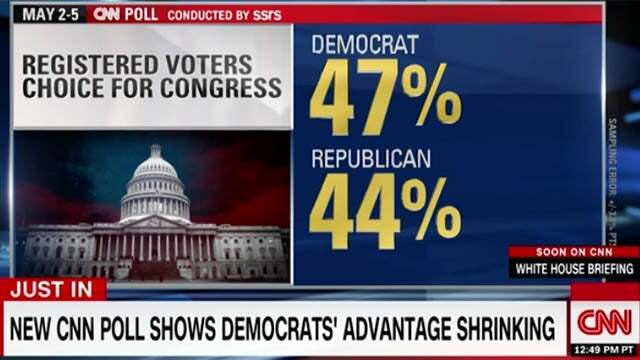 RUSH: By the way, one interesting tidbit from the CNN poll, which shows that the generic ballot advantage Democrats had is gone. The survey also asked people to rate various things and their importance to them. The nation’s economy, important; 84% call it extremely or very important. Now, that’s up from 79% in February. Immigration, 76% of the people in the CNN poll say it’s very important. Taxes, 73% say very important. Russia investigation, 40% say very important, down from 45% in February. That’s not the way to look at it, ’cause the investigation’s it is not gone anywhere. It’s still is in the news 24/7! The Russia investigation has not gone dormant! That’s all the Drive-Bys are talking about — and it’s driving people away, is the point. People have had their fill of it! And the reason why: You can’t maintain your emotional reservoir this long without having it refilled, and there’s nothing. If there were something, it would have been leaked. They don’t have anything.